EdPuzzle is a free assessment-centered tool that allows teachers and students to create interactive online videos by embedding either open-ended or multiple-choice questions, audio notes, audio tracks, or comments on a video. Edpuzzle interactive videos can be made with videos from a number of websites, including YouTube, TED, Vimeo, and National Geographic. EdPuzzle is a great formative assessment tool for teachers who run a flipped classroom, assign videos for homework, or want to encourage asynchronous communication. Teacher also can have students use EdPuzzle to show whether or not they achieved the goals at the end of the semester. In EdPuzzle teachers can create online classes and upload original videos or select online videos, add interactive features, assign those videos to students, and send the video assignments to students’ email addresses by providing either access code or a link. EdPuzzle enables teachers to keep track of how many students watched the video, what percentage of the video students watched, when they watched it, what questions in the video students answered right or wrong. Substitution: Students answer questions on a video rather than on paper. 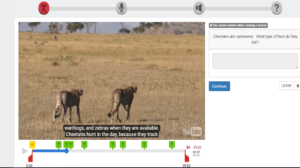 Augmentation: Teachers can enhance the videos they show in class by adding their own narration into the video to clarify concepts or highlight key points. Modification: Students use EDPuzzle to add multiple choice and open-ended questions to a video from the teacher. Once they have created their own interactive videos, students can exchange their videos with classmates, complete classmates’ video quizzes, and provide feedback on the quality of their classmates’ interactive videos. Redefinition: Students and teachers can share their EdPuzzle interactive videos with people around the world, collect data from the individuals who respond to their questions, and analyze the data. Far too often, technology is used as a direct substitute for other low-tech tools (e.g., pencil and paper). While substitution has some benefits (e.g., students develop their technology skills and knowledge), we encourage you to think about how you might use EdPuzzle to modify or redefine learning. 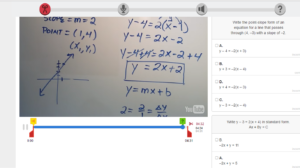 After covering the topic “slope,” go to EdPuzzle and search for a video (e.g., how to find slope on a line) by using Khan Academy, which is a tool that contains tons of math videos. 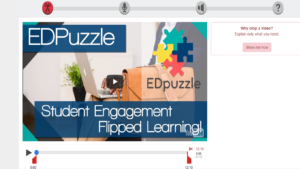 Embed your own voice and questions in the video, add it to your online class on EdPuzzle and share it with your students via online class on EdPuzzle. After that, ask your students to answer the questions in the video and track their answers and progress. Provide immediate feedback to scaffold student learning. In order to create awareness of climate change, each student finds a climate change-related video. They customize it by embedding their own voice and adding some questions in it. Then, students gather all the videos, synthesize them into one video in a meaningful way, and create a video gallery to present it in upcoming showcase in school. By using National Geographic Channel on EdPuzzle, find a cheetah video and share it with your students. Give it as assignment for them and tell them to watch it before they come to school. Once they come to school, have them discuss about the video in groups. Students watch a video about the different types of government structures. They develop a list of questions about this topic and embed their questions directly into the video via EdPuzzle. They can share their EdPuzzle video with a teacher or expert (via social media) to solicit responses to their questions. Baker, A. (2016). Active Learning with Interactive Videos: Creating Student-Guided Learning Materials. Journal of Library & Information Services in Distance Learning, 1-9. Select your video that you just edited and assign it to your students in your class by clicking on “assign/share” button on the top. And then, assign it for your class on EdPuzzle.